New Delhi: Prime Minister Narendra Modi has asked Union Finance Minister Arun Jaitley to reconsider the budgetary proposal under which a part of the Employees Provident Fund (EPF) withdrawal will be taxed. According to sources, Jaitley had written to Speaker Sumitra Mahajan, seeking permission to make the statement on Friday which would have outlined the revised proposal. Though the House was adjourned due to the death of former Speaker PA Sangma’s death, sources said the FM may seek to make the announcement on Tuesday when the House will reassemble. Modi has asked Jaitley to do away with tax imposed on EPF withdrawal after a massive row over the proposal. According to sources, Modi requested Jaitley to revisit the proposed tax on 60% of Employees Provident Fund withdrawal. Although the Budget has proposed to tax 60% of the EPF amount at the time of withdrawal, the deposits made up to March 31, 2016 would be exempted from the proposed levy. The government is taking several options into consideration to lessen the impact of the proposal on the salaried middle class in view of the protests from within the BJP, Opposition and other quarters. Two days ago, an official-level meeting was held in Prime Minister’s office (PMO) on the EPF tax issue, adding that the Finance Minister is likely to make an announcement the exemptions on the floor of House when he replies to budget. Among several options, the government is learnt to be looking at levying tax only on the interest earned on the corpus created from April 2016, wherein also exempting the principal from the levy. The next option is to keep the tax limited to accounts that will be opened from April 2016. Even though the finance ministry has said that only 70 lakh out of 3.70 crore active EPF subscribers will be impacted by the proposed tax change, a rethink has been prompted because of protests in Parliament. 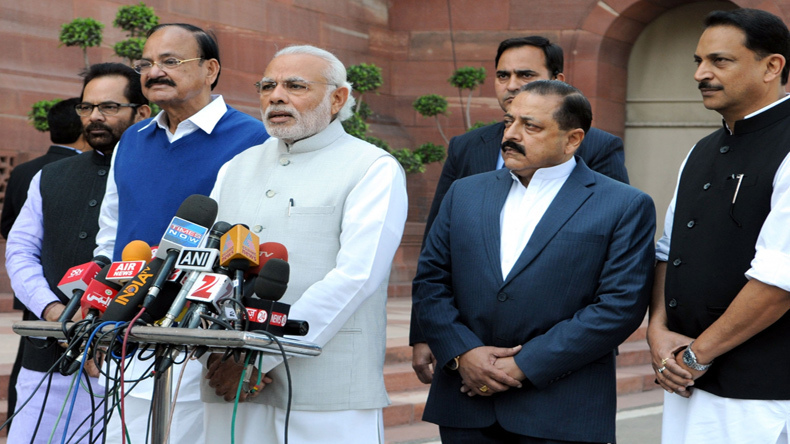 The Bharatiya Janata Party (BJP) lauded the Prime Minister for taking up the issue.